I am so looking forward to getting to type out the names of these schools and places over the next half-hour or whatever. I really, really am. I've printed out my KHSAA playoff brackets (you can, too--they're linked here under the bold-face "Class A," "Class 2A," etc. labels), and I've got Mayfield's WYMC fired up on another browser (Roberta Flack's perfect "First Time Ever I Saw Your Face" is playing). So here we go. Hooray for the Internet! Hooray for high-school football! And hooray for Kentucky! Horse Cave Caverna (2-8) at Mayfield (9-1 and No. 1 in this week's Associated Press poll for Class A)--Next up on WYMC was Journey's "Don't Stop Believing," which is also great. Louisville Kentucky Country Day (5-5) at Russellville (8-2, No. 3)--I did not realize that the current Panthers quarterback, Barrett Croslin, is the grandson of Ken Barrett, Russellville's long-time, multiple-state-championships coach. Hooray, too, for Jim Turner of The Logan Journal! Dayton (2-8) at Frankfort (8-2, No. 7)--You're killing me, WYMC. At this rate, I'm never going to finish typing in these games. Ludlow (4-6) at Paris (8-2)--Here's the Class A game I would like to be at tonight, the 1975 Class A state champs at the 1973, 1981 and 1982 Class A state champs. Ludlow '75 beat Coach Orville J the Heath Pirates, so I will, of course, be rooting for the home team tonight. Bracken County (2-8) at Fort Mitchell Beechwood (6-4, No. 5)--Zack Klemme in Maysville's Ledger-Independent writes of Polar Bears and inevitability. Not Westwood Fairview (5-5, No. 8) at Allen Central (2-8)--It's on to Round 2 for the Rebels of Eastern. Hancock County (2-8) at Caldwell County (10-0, No. 1)--Yeah ... a bunch of offensive linemen getting together on their own, "coming up with crazy stuff to call each other" ... can't imagine anything going haywire there. Barlow Ballard Memorial (7-3) at Union County (8-2, No. 8)--Here's the Class 2A game I'd like to be at tonight. Good matchup. Washington County (4-6) at Glasgow (9-1, No. 4)--Scotties rising. Erlanger Lloyd Memorial (6-4) at Walton-Verona (8-2)--Third-straight playoff clash for these two, notes James Weber at NKy.com. Lloyd won in 2011; W-V, in 2012. Owen County (2-8) at Newport Central Catholic (6-4, No. 6) at Newport on Saturday--NewCath is the defending state champ. Leslie County (3-7) at Middlesboro (8-2, No. 9)--Lee Majors Field, baby! Somerset (5-4) at Betsy Layne (9-1, No. 10)--The Scribe at BluegrassPreps.com foresees a big run for the Briar Jumpers. Adair County (4-6) at Paducah Tilghman (5-5, No. 9)--Check out this fantastic picture of downtown Paducah that Channel 6 posted this morning. I doubt fog's going to be an issue for tonight's games, incidentally. 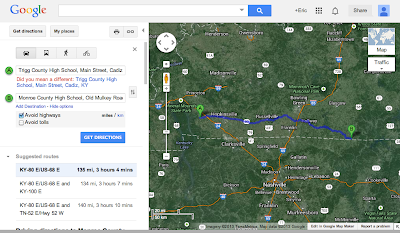 Trigg County (5-5) at Monroe County (7-3)--Pretty good matchup, but it's the Class 3A game that I'd most like to attend tonight mostly because I love the route across beautiful southcentral Kentucky. This is my fan-bus road trip of the week, and I hope it left early enough from Cadiz this afternoon so that everyone could enjoy the autumn scenery. And they should be able to pick up The Eddie Stubbs Show on Nashville's WSM 650 AM on the bus radio the whole way back home. Casey County (2-8) at Louisville Central (7-3, T4)--... That is, if you are willing to consider Region 1's South Warren as the state's No. 4 team. It and Louisville Central, the three-time defending state champ, were tied for fourth in this week's 3A poll. Corbin (8-2, No. 7) at Henry County (6-4)--It has been an odd week at Corbin High. Louisville Moore (4-8) at Shelbyville Martha Layne Collins (8-2, No. 5)--The homestanding Titans are peaking. Louisville Doss (6-4) at North Oldham (7-3)--WYMC is playing Rolf Harris's "Tie Me Kangaroo Down, Sport," so I'm starting to make some hay on getting these games typed in. Boyd County (1-9) at Fort Thomas Highlands (9-1, No. 1)--The Bluebirds are going for their seventh-straight state championship, the most recent two coming in Class 4A. Owensboro Apollo (2-8) at Bowling Green (9-0, No. 1)--The Purples are trying for a third-straight state championship. Covington Scott (7-3) at Franklin County (9-1, No. 6)--Pretty good game, potentially. I guess this is the 5A game I'd most like to be at tonight. Scott was ranked off and on during the season. Boone County (0-10) at McCracken County (8-2, No. 7)--Heady times in western (but not West) Paducah. The Mustang volleyball team won its first game in the state tournament today and play Louisville Assumption on Saturday. Louisville Eastern (4-5) at Louisville Trinity (4-5, No. 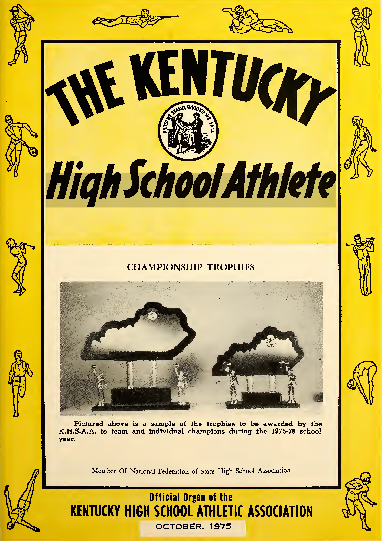 5)--The KHSAA has awarded six 6A state championships, and Trinity has five of them. Louisville Saint Xavier (6-4, No. 6) at Louisville Fern Creek (6-4)--St. X has the sixth. It came in 2009. Hurrah! Mustangs win! After beating Boone County, 55-10, at Marquette Stadium, it's on to the second round for Coach Orville J and McCracken County High! The second-round opponent will be Central Hardin, a 48-0 winner over Daviess County tonight. McCracken County and Central Hardin were ranked seventh and eighth, respectively, in this week's Class 6A AP poll. Class 4A delivers the rare first-round upset: Mercer County 31 at No. 10 Knox Central 14. The Wildcats score on some crazy 40-yard option run in which the WKDZ play-by-play guy was faked out and didn't see the pitch--he said he'd already looked down to write it down as a 2-yard loss for Trigg County. The Wildcats extend their lead to 34-27 at Monroe County with 7:36 to play. Henderson County finishes off Muhlenberg County, 53-13. The Region 1 Class 6A semifinals next Friday will pit No. 8 Central Hardin at No. 7 McCracken County and Henderson County, which received votes for this week's poll and was ranked most of the season, at No. 9 Meade County. Personal-foul face-mask penalty on Trigg County! WKDZ says Monroe County is going for the win! First man through--not the guy who ran eight straight plays--carries the one-and-a-half yards for the two-point conversion, and the home team is ahead by 35-34 with 34 seconds to go. WKDZ says the Monroe County drive was 15 plays for 74 yards over 7 minutes, 2 seconds. 5-6 finish for Trigg County ... second-straight losing season ... first time that's happened since 1998 and '99 for the Wildcats, says WKDZ, which is PHENOMENAL. Upset to everyone but The Scribe at BluegrassPreps.com: Somerset 29 at No. 10 Betsy Layne 20 in Class 2A. Not exactly an upset in Class 3A: Lawrence County (which received votes in this week's poll) 36 at Magoffin County 20. Visiting winner in Class 2A: Carroll County 29 at Newport 21. Class A non-home winner but also non-upset: Paintsville 61 at South Floyd 20. Paintsville is 8-3 and received votes in last week's poll. South Floyd finishes 3-8. Per The Logan Journal's Facebook page: "Russellville advanced to the second round of the Class A football playoffs Friday by crushing Kentucky Country Day 55-6. Barrett Croslin threw touchdown passes to Zach Hendley & Lee McMurry, ran for a TD and returned a punt for another. Demarcus Hampton ran for a 93-yard TD and had 176 yards on 5 carries, eclipsing the thousand-yard mark. Coco Darden blocked a punt and returned it for a score. Desmon Quarles & Josh Bigbee also ran for TDs, and Corey Wright & Milam Watkins kicked multiple conversions. RHS (9-2) goes to Bardstown Bethlehem (11-1) in the semifinals next week." In Class 2A, No. 7 Bardstown won, 21-13, at Green County. Region 1 semis: No. 8 Union County at No. 1 Caldwell County and Murray (vote-getter) at No. 5 Owensboro Catholic. Region 2 semis: No. 3 DeSales at No. 4 Glasgow and No. 7 Bardstown at No. 2 Christian Academy of Louisville, which had a bye tonight. Region 3 semis: Carroll County at Gallatin County and Walton-Verona vs. tomorrow's No. 6 NewCath/Owen County winner. Region 4 semis: Somerset (vote-getter) at No. 9 Middlesboro and Danville at Prestonsburg. In Class 3A, No. 7 Corbin won, 24-10, at Henry County. Home losers in Class 6A: Tates Creek (finishing the season 6-5), 28-16 to Paul Laurence Dunbar; Ballard (5-6), 41-0 to Manual, and Seneca (2-9), 49-6 to Dixie Heights. And Fern Creek (6-5), 26-0 to St. X, and Lafayette (3-8), 28-14 to Bryan Station.